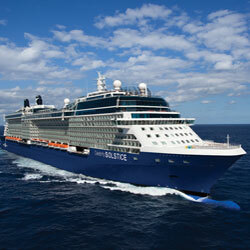 Celebrity Solstice is one of Celebrity's more decorated ships at sea. So it's no wonder that it's full of "firsts." Like the first Lawn Club at sea. The first Hot Glass Show, a custom-designed, outdoor glassblowing studio. Some other things that set the Celebrity Solstice cruise ship apart are its specialty restaurants. Our passion for outstanding cuisine has taken the restaurants, the food and the overall dining experience to a whole new level in the cruising world. 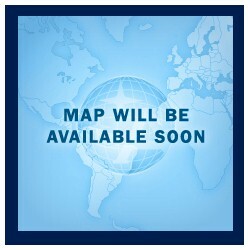 But staterooms and specialty restaurants are only part of the charm. Celebrity Solstice also has the luxury spa, Canyon Ranch SpaClub, where you can pamper yourself with spa treatments or push yourself in a workout with one of our trainers. Hotel, a celebrated historical landmark located in the heart of downtown Seattle. Convenience is key here- you're close to Pike Place Market and many other Seattle hot spots. Afternoon: Start exploring right away. Pop into an indie coffee shop for some local brew- Seattleites love their java. Take in Chihuly's stunning glasswork. Or visit the experts at the Celebrity Cruise Hospitality Desk to book tours, reserve restaurants, and gather tips. They're here to make sure your stay is your personalized idea of fabulous. Evening: Seattle's nightlife is hopping. Comedy and improv? Check. Dinner and dancing? Absolutely. Seattle's got something for everyone. If it's R&R you crave, stop by Penelope & The Beauty Bar at your hotel for some much-deserved pampering. Or take a stroll through the lobby to view early 20th century elegant décor. Morning: After your complimentary breakfast, jet set off on your guided tour to the Future of Flight Aviation Center. Go behind-the-scenes in the assembly plant and one of the largest buildings in the world. Visit the Boeing Theater and interactive exhibits. Test your flying abilities with the flight simulator-we won't judge if you decide it's best to keep your day job. Afternoon: We've arranged a special lunch at a waterside restaurant to kick off the afternoon part of your tour. 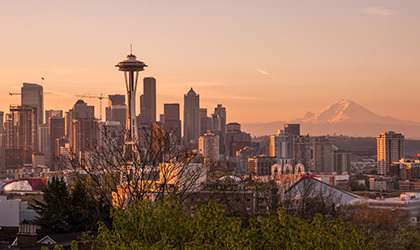 Visit downtown Seattle with local experts and leave no (Seattle) stone unturned. Check out the sports stadiums, Seattle's Chinatown, and the Pioneer Square district. The sky's the limit on this tour-literally. End your tour 605 feet above ground on the Seattle Space Needle with views of Mt. Rainier, the Cascade Mountains, and the Olympic Mountain range. Evening: Stop by the original Starbucks for a coffee nightcap. Or watch Seattle's super-speedy shuckers in action at a local oyster bar. Craving some downtime? Take a dip in your hotel's posh indoor pool. Decisions, decisions. Morning: After your complimentary breakfast, indulge in some downtime. Or check out the Puget Sound sea life at the Seattle Aquarium. Your Celebrity Cruises Hospitality Desk is also available for tour recommendations or suggestions to explore on your own. Seattle, and Pike Place Market. There's even a truffle café specializing in (yup, you guessed it) all things truffle. Evening: Walk off the food tour with stunning views of the downtown waterfront-just five minutes from the hotel. Or unwind in the jacuzzi before turning in for the night. Morning: After breakfast, we'll take you to the port. Get ready to set sail aboard the award-winning Celebrity Solstice.